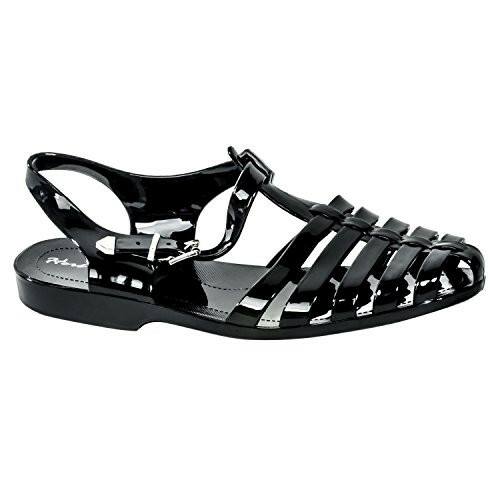 Jelly sandals go classic! Take a look at our Bequia's design - doesn't this look like a warm weather shoe that will never go out of style? That's because it won't. People have been wearing flat heeled cage sandals for centuries. Literally, centuries. And they still look good and we still buy them every chance we get. Now this wardrobe necessity gets a little modern tweak in black and clear jelly. Keep a pair handy for daring treks to the store, adventuresome sojourns to the park or to the beach, or for lengthy excursions to your favorite restaurant with friends. Classic never felt so good! Available in sizes 5 to 10. Love these! Throwback, just how I remember them as a kid. Just like the chanclas I had as a little girl. Heart eyes for this black jelly sandal! This sandal is very nice. Um, I do run in them and still didn\'t break. I love it!